When is an apple not really an apple? And what does this silly question have to do with exploring our collective digital dependence? An apple is not really an apple when the 3-dimensional, more or less round-ish, faintly applish-scented, red or green piece of fruit is replaced by something standing in for it—an abstract symbol of some kind. 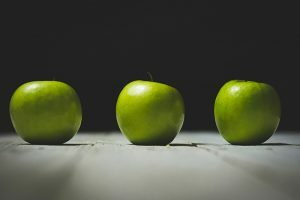 The most common form of abstraction or symbol occurs in written and spoken language: the word “apple” is a symbolic representation of the real thing. Without getting into all the left- and right-hemisphere brain stuff, we know that in order for the word “apple” to have a true depth of meaning for someone—a richness in their symbolic thinking—they need to have had real, 3-dimensional experience with actual apples: holding them, biting them, sniffing them, perhaps even picking them in an autumn orchard—a richness in their concrete experience with which their abstract thought connects. An aside: This is why I don’t promote academics for young children, when their brain circuitry isn’t yet optimally wired up to process abstractions and symbols. When introduced too early, symbols such as words and numbers are “learned” in a rote, mechanical way. Such learning has little depth of meaning for a child, and leads to a more superficial interaction with words, ideas, and concepts. As child psychologist David Elkind points out, “The language of things must precede the language of words, or else the words don’t mean anything.” Not the best way to begin a child’s lifelong learning, and certainly not conducive to the flexibly innovative, layered thinking capacities needed to forge peace, innovation, and prosperous sustainability! Turns out there is a long list of things that endanger our health by closely resembling substances, processes or energies that are native to our bodies but which in fact are not, and therefore wreak havoc with our wellbeing and our health. And it is around this exact point that I had a big “ah-hah”—a new, key vantage point from which to view digital dependence and consider ways toward healthy mastery of our devices. Just as BPAs (the bad stuff in plastic), PCBs and even ingredients in common personal care products can disrupt health by mimicking our natural hormones, Michael Mendizza posits that “screens are dead but mimic living systems.” “Compared to a living face the same face on a screen is sensory deprivation, containing a distorted fraction of the information and meaning of the living system it mimics. The more we interact with the dead counterfeit the less attuned, sensitive and empathic we are when relating with a real face.” Over the past decade a mountain of evidence has been gathered to show that social media use can be associated with depression; the most recent study was just released, showing that in the U.S., “attachment to devices and the constant use of technology is associated with higher stress levels” for those who reported “constantly or often” checking their email, texts, and social media. Could it be that we are hungry for connection, but trying to gorge on what Mendizza calls a “dead counterfeit” of connection? Could it be that social media (I’m not naming names, which may or may not contain, ironically, the word “book”) are the little chocolate donuts of our collective social landscape? Where memes, emojis and “post engagement” are trans fats that seem to satisfy, yet instead cause suffering? Are we seeking the nourishment of human connection but embracing its virtual abstraction instead? The less screen time before the great neural pruning around age eleven the better. Fill their life with safe, challenging natural living experience, open, develop and expand their capacity to imagine by immersing them in story and rich descriptive language, and model empathy for all living things; with this as the dominant influence during the early years let them have all the technology they want as teens and watch them soar. Whether you’re curious, captivated or concerned about our digital dependence and device devotion, join me on (most) Wednesdays so we can explore it together. (Sign up here if you want to be sure not to miss anything!) ….. ….. This entry was posted on Wednesday, March 15th, 2017 at 6:31 pm	and is filed under Parenting for Peace. You can follow any responses to this entry through the RSS 2.0 feed. You can leave a response, or trackback from your own site.